"If you would like to 'do' something for me, a nice handmade post/card, an occasional email, a live plant, a cheap iTunes card sent three or four months from now." We immediately launched a postcard project and were joined by Pamela from San Diego and Gwen Diehn (honorary members of our Journal Study Group), We each selected a day of the week, and on our individual day every week, we mail Melly a postcard that we make. My day is Saturday. At the end of this project, we will work with Melly to see what we can make to keep all of the postcards together. It was only after she received our second cycle of postcards that she realized that there was a postcard campaign. She has received 4 cycles of chemotherapy so far and next week will be her upswing week, so she should have more than 70 postcards of love by now. "I have been loving the postcards you guys are sending. Pamela always sends a quilted card, exquisitely finished with a quote or poem printed on the back. Perhaps when she comes next she might describe and demo the process. Gwen keeps me up to date on her most current creative endeavor-I have gotten small pieces of the puzzle and this week, I may be seeing the whole picture, it is amazing. Pat, I imagine you stamping out each word, I want to see you do it. 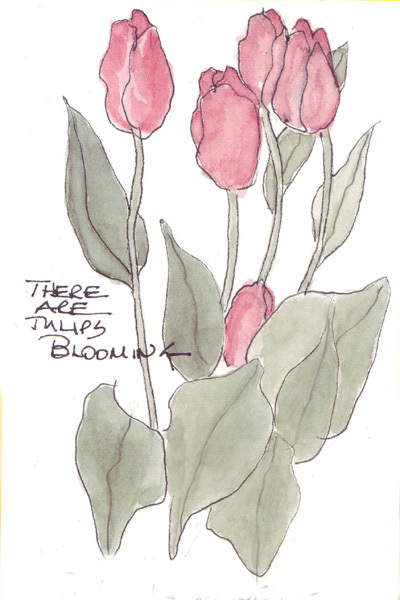 Shirley's colors are getting brighter and more confident and she seems to settle into her style with each month, day, and certainly each card. Benedicte is firmly entrenched in envelope use. Teri pipes up and and pulls things from her hat. My collection of cards is growing and I feel truly honored that you guys have been doing this for me. I have pulled the stack out my desk, I will need a new and longer ribbon to contain them all." 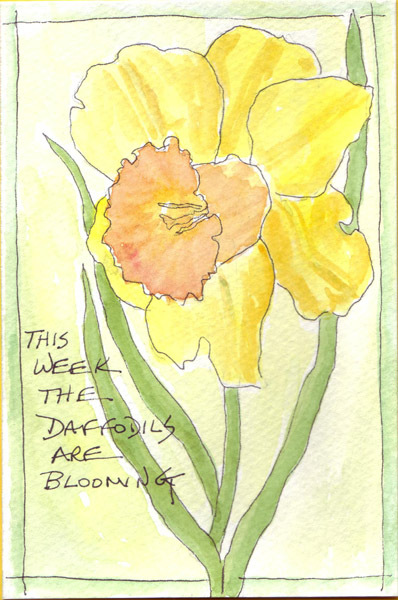 Here are my last 2 postcards for Melly: my tulips from last week and my daffodil from this week - which will soon be delivered to my corner letter box for mailing. 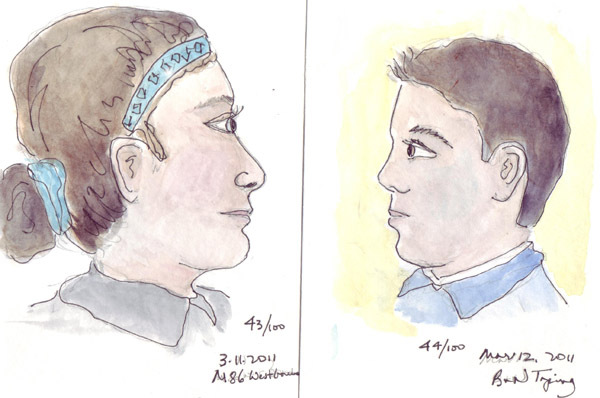 I am still sketching faces as part of the Carla Sonheim Faces Lab from her book Drawing Lab. My goal is to draw 100 - slowly - and I'm nearing 50 now. Here are 6 more that haven't been posted - 3 from the crosstown bus and 3 from people sitting in rooms I've been in. 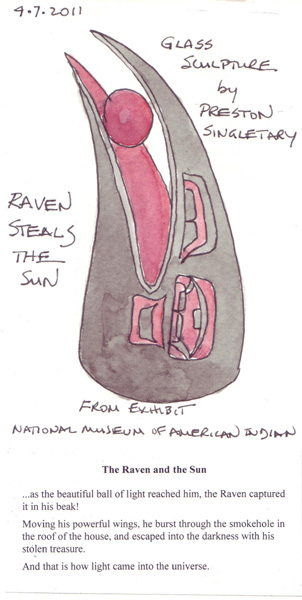 Thursday morning I met my art friends Teri and Judy at the National Museum of the American Indian - NYC branch - to see and sketch in two exhibits. Preston Singletary, a glass artist, uses symbols from his Tlingit Native American heritage and the pieces are magnificent. I chose to draw these two glass sculptures because of the legends. The first is the story of the Raven and the Sun. This is the end of the story: ....as the beautiful ball of light reached him, the Raven captured it in his beak! Moving his powerful wings, he burst through the smokehole in the roof of the house, and escaped into the darkness with his stolen treasure. And that is how light came into the universe. My second drawing was of an Oystercatcher Rattle - used by the shamans for healing. The writing on the journal page, taken from a quote in the exhibit says: "In the old days things were made for a purpose, and there was a story and maybe even a dance that went along with it." This sculpture represents the oystercatcher bird, and on his back we see the shaman, the seducer, and probably a goat. These figures are very symbolic in this story. 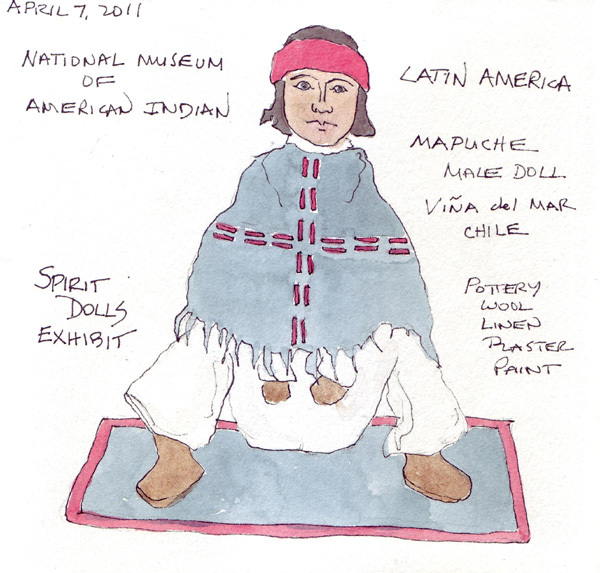 The other exhibit we saw was Small Spirits: Dolls from the National Museum of the American Indian. 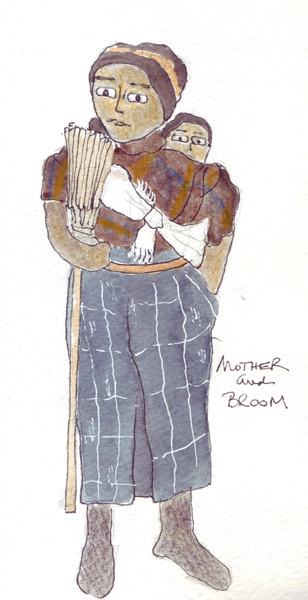 I sketched one doll while at the exhibit and the second from a museum photo because I couldn't get the mother and child out of my mind. There is a wonderful exhibit of Sonia Delaunay's textile designs, drawings, and paintings at the Cooper-Hewitt Museum and my friend Pat and I spent the morning there today. 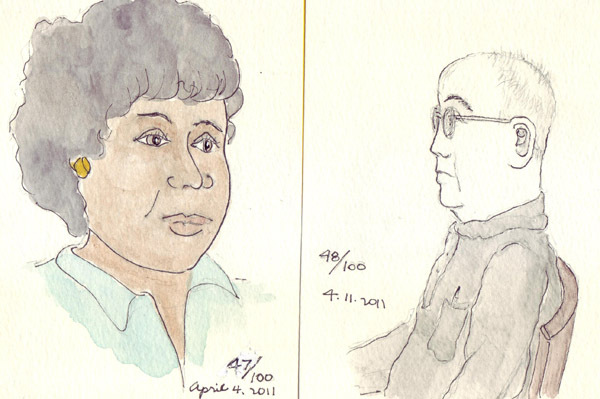 The website has a long video entitled Converation Among Friends and while watching it, in preparation for my visit, I sketched one of Sonia's friends. 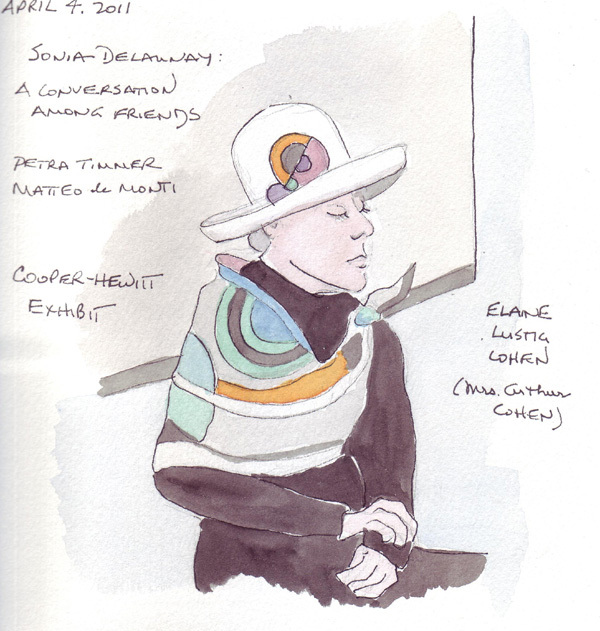 She was wearing a Delaunay-designed scarf and a hat she made from Sonia's fabric. 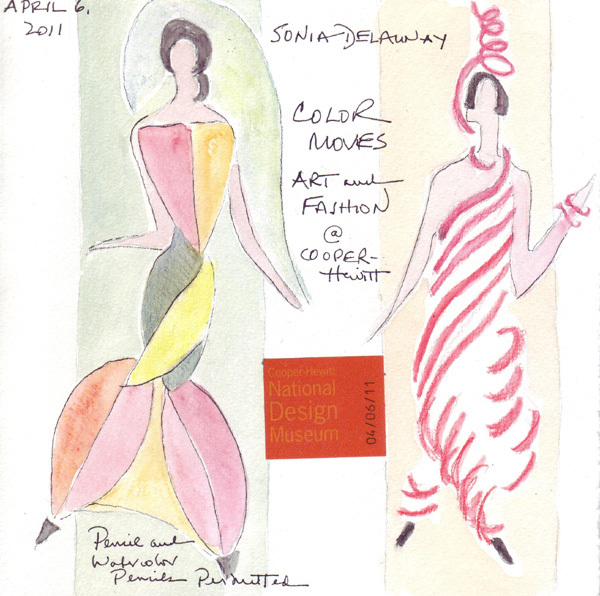 Today I sketched several of Sonia's fashion illustrations and many of her textile designs. While I've seen an occasional one of her paintings, this exhibit was remarkable and her art so varied. 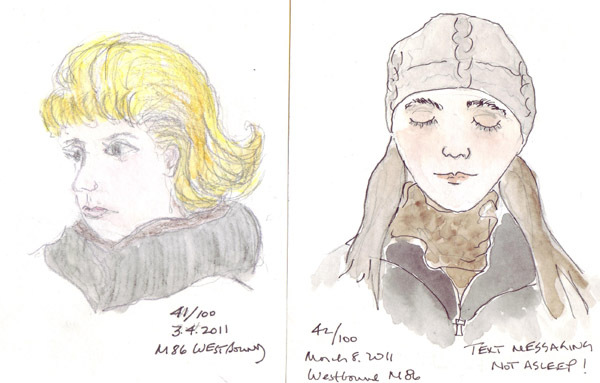 Here are two of her fashion illustrations that I copied. I was in Washington DC this week for a meeting, and the cherry blossoms were in full bloom and there were pansies and daffodils seen everywhere. I'm definitely yearning for spring! 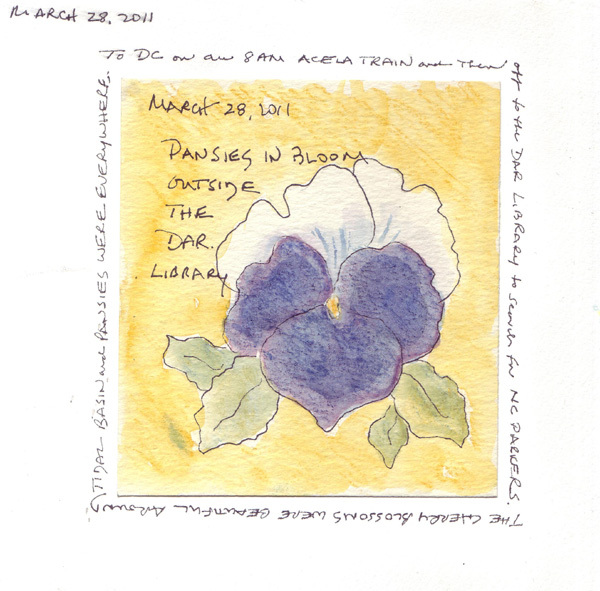 Here is a quick pansy sketch - which I painted with watercolor pencils. 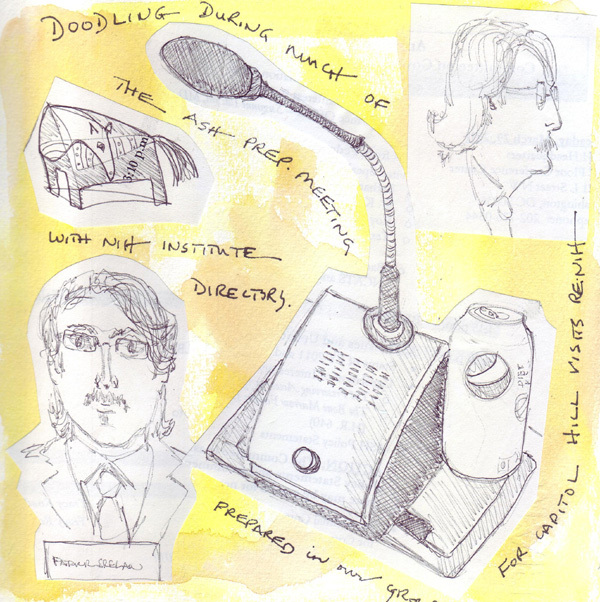 During part of my meeting I doodled to stay focused and here are some of the images that I sketched. The many positions of the microphones are endlessly fascinating. I think I posted a whole page of them from this meeting last year.